SeaWorld is taking on its critics but is finding that the tide of public opinion - and investor sentiment - is not easing up in the wake of attacks by animal rights groups. 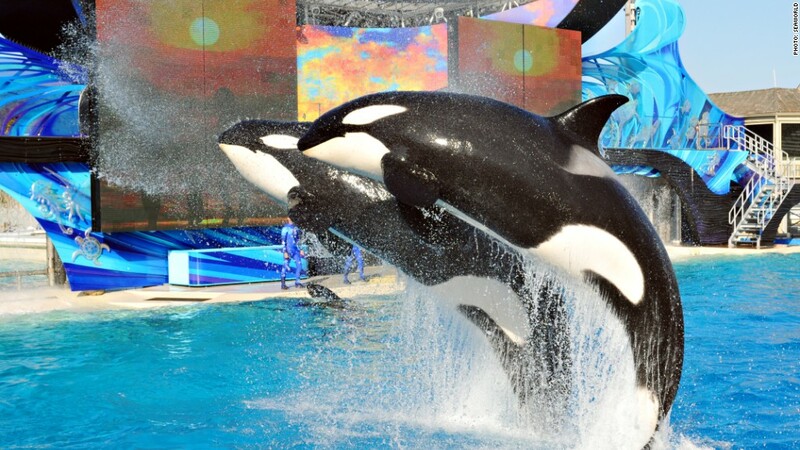 In an advertising campaign unveiled Monday, SeaWorld (SEAS) said it is planning on "setting the record straight on false accusations by activists who oppose whales and other animals in zoological settings." SeaWorld has come under fire for its treatment of killer whales, or orcas, ever since an unflattering documentary called "Blackfish" aired in theaters in the summer of 2013 and on CNN in the fall of that year. The company did not mention "Blackfish" by name in its release, but interim CEO David D'Alessandro did not mince words when addressing the company's detractors. "There's been a lot of misinformation and even lies spread about SeaWorld, and we recognize that it has caused some people to have questions about the welfare of killer whales in human care," he said. SeaWorld had some particularly harsh things to say about the animal rights group People for the Ethical Treatment of Animals, or PETA. "In the past two years, PETA has issued more than 110 press releases about SeaWorld, filled with inaccuracies about the company's animal care," SeaWorld said. In the first ad, which appeared in newspapers on Monday, SeaWorld accuses PETA of "not giving you the facts" about how long orcas live in what the animal rights group dubbed "captivity." PETA claims that the lifespan drops to nine years at SeaWorld. But SeaWorld counters in its ad that the lifespan is 46 years, comparable to how long killer whales can live in the wild. SeaWorld cites news reports, independent research and accounts from its head veterinarian. Lisa Lange, senior vice president of PETA, said that their organization counts stillbirths in its life expectancy figures and alleged that SeaWorld does not. Lange added that it's "shameful" for SeaWorld to spend money in order to "rehab its image while animals languish in tanks." SeaWorld has also pledged to spend $10 million to study killer whales in the wild in addition to its new marketing campaign. It's unclear if SeaWorld's new marketing blitz will help change the public's perception of the company. The negative attention from "Blackfish" and animal rights actitvists has hurt SeaWorld significantly. Attendance fell in 2014 as did the company's sales. The stock price of SeaWorld, which actually surged when it first went public in April 2013, has plunged in the past year and a half. It's down nearly 40% in the past year and is about 50% below its all-time high. Private equity firm Blackstone (BX), which bought SeaWorld from Anheuser-Busch InBev (BUD) in 2009, has sold a big chunk of its stake in the past year. Blackstone still owns about 22% of the company though. Simply put, the company has to convince consumers to come back to its theme parks. Right now, that's a tough sell. Circus operator Ringling Bros. recently announced it will stop using elephants in its shows. 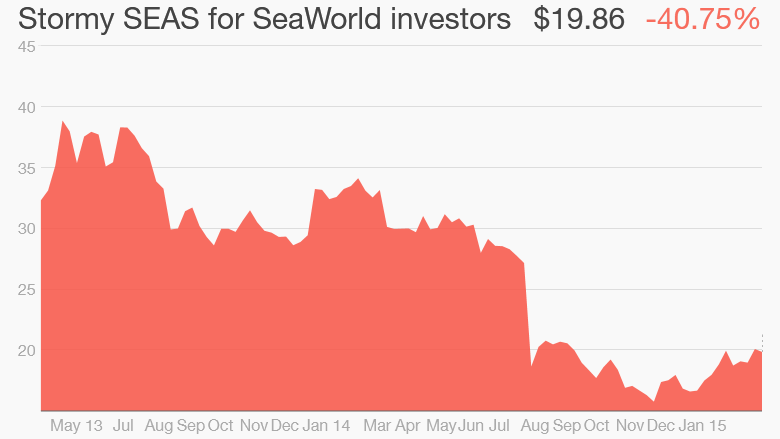 SeaWorld will probably face more calls to free its orcas. "Public opinion has completely changed on the keeping of captive animals," Lange said. And while PETA has many of its own detractors due to its occasionally over-the-top publicity stunts, Wall Street clearly agrees with the animal rights group right now. SeaWorld has already cut ticket prices to lure customers back, but that does not appear to be working as well as hoped. So it will probably take more than "splashy" newspaper and TV ads to convince families that they should ignore "Blackfish" and spend big bucks to visit Shamu in Orlando, San Diego or San Antonio.